In order for advertising to work, it’s supposed to be somewhat, at least remotely, believable. So when Microsoft claimed that someone actually switched from using a Mac to using Windows, we knew something wasn’t quite right! Actually I do know people who switched from using a Mac to using Windows, but… It’s always been under the circumstances of a job. See, I had to switch from wearing shorts to wearing pants, not because I chose to, but because the people who pay me demanded it of me. I’m also forced to use Windows at my job, but as I’ve mentioned before, that does not make me a Windows user, by my definition anyway… Before being hired I demanded that I have a Mac to use… Some people aren’t that fortunate, and can’t demand their computing platform when selecting a job. Honestly though, I’m sure there are people who switched from using the Mac OS (pre OS X) to using Windows, and were probably happy doing it. 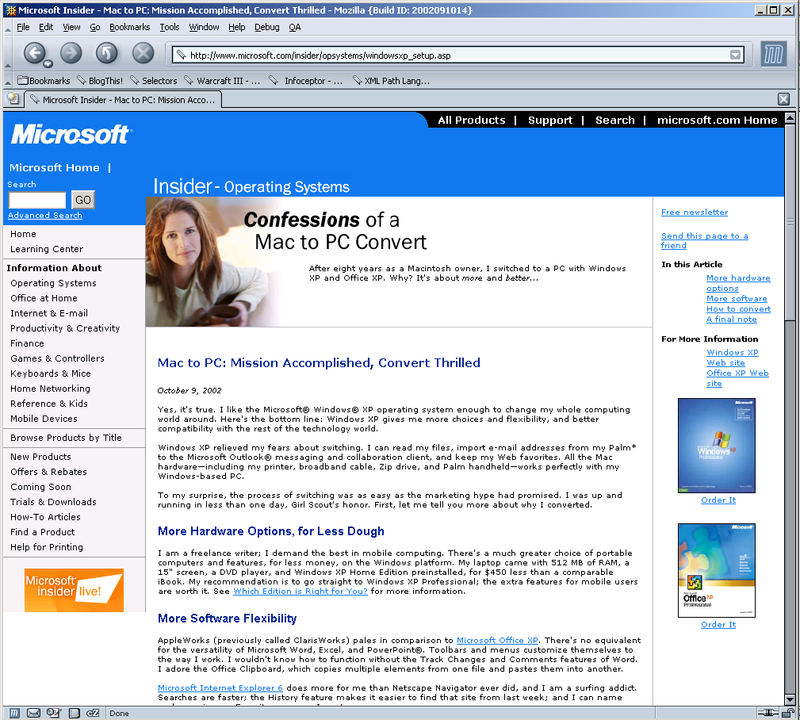 Now, could we find someone who switched from using Mac OS X to using Windows XP? I dunno… The search is on! Posted on Tuesday, October 15th, 2002 at 8:02 am. Subscribe to the comments feed. Both comments and pings are currently closed. Post on your own blog.